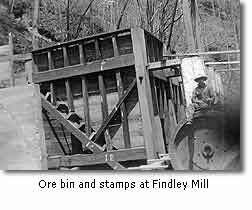 The Findley Gold Mine was one of Dahlonega’s most famous and productive mines for almost a century. Opened shortly before the Civil War and abandoned soon after the United States entered World War II, the mine site was largely forgotten over the years except by history buffs and gold mining enthusiasts. Crisson went on to explain that Findley had gone into partnership with local entrepreneur Harrison W. Riley and the two of them had worked the mine to a depth of 160 feet. At that point, they struck a vein of water, which poured into their shaft and forced them out. Crisson also gave an eyewitness account of seeing Findley hand-mortar a gallon bucket of ore taken from one of the mine’s pockets. When he had removed the rock, a half-gallon of pure gold was left. An interesting story about Duncan was related by W. R. Crisson’s son, E. E. Crisson to Andrew W. Cain, who includes it in the section on the Findley Chute in his History of Lumpkin County for the First Hundred Years 1832-1932 . According to the story, Duncan claimed he was part Indian and said he could dream where to find gold. It was supposedly in such a dream that he saw an incredibly rich vein of solid gold and knew where to dig to find it. Prior to Duncan’s discovery, vein mining was still relatively new in the area. Gold had been discovered near the Chestatee River in 1828, but the miners who flocked to north Georgia hoping to strike it rich panned the streambeds using placer mining tools and techniques, including pans, sluice boxes, and rockers. They did not initially realize that the loose particles of gold did not originate in the streams but had washed down from the hills by the forces of erosion. It was not until the “easy gold” had been found that men turned their sights and their shovels into the hillsides in their quest for the precious metal. The history of ownership of Land Lot 1,048, on which almost all the Findley mining operations took place, is complex, for it was divided into half- and quarter-lots, all of which changed hands more often than pieces of property on a Monopoly game board. Disagreements about ownership followed by law suits were common. Information about the numerous owners is available, but this article will focus only on those who made significant developments to the property. The lot was originally granted by the State to Talbot Davison, of Jones County, in the Cherokee land lottery of 1833. Although there were several owners in the years between 1833 and 1852, apparently the first person to make any use of the land was Charles M. McJunkin, a woodcutter. After having cut the timber on the property, he sold his half of the lot to James Jefferson Findley in February of 1858. At that time the lot was considered an “old horse” that had seen better days. Findley and his partner, Harrison W. Riley, worked the chute for three or four months and excavated a 4 by 6 foot incline shaft “sufficiently large to permit three men to work at the same time.” The rich yields from the mine were reportedly carried to the Dahlonega Mint in a bucket after dark to avoid attracting attention. Findley’s and Riley’s operations came to an abrupt halt when water filled the shaft to a depth of 8-10 feet. Subsequently, the Findley property was sold to the Stephenson Gold Mining Company in 1863. 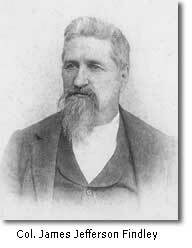 Dr. M. F. Stephenson (assayer at the Dahlonega Branch Mint 1850-1853) sunk a 100-foot shaft at the top of the hill north of the chute. He then cut a tunnel from the bottom of the new shaft that was designed to strike the chute from that angle. His operations were halted by the scarcity of labor and the high price of powder for blasting the rock. Later operations proved that his tunnel stopped only five or six feet from the chute. The Dahlonega Mining Company purchased the Findley property in 1866 but did little work on the mine aside from running a long tunnel designed, like Singleton’s, to strike the chute at the bottom of the incline (a distance of about 500 feet). After driving 300 feet, Superintendent Amory Dexter halted work after workers hit a belt of very hard rock. His decision was also influenced by a title dispute. In 1868, the Dahlonega Mining Company leased the Findley and Lockhart mines to local miners Crisson and Huff. 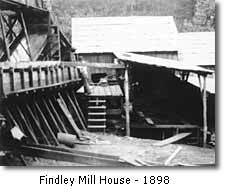 In 1871, W. R. Crisson (Huff having retired by this time) moved the Lockhart’s 24-stamp mill to the Findley and began mining operations on that property after replacing the badly worn stamps with new ones. 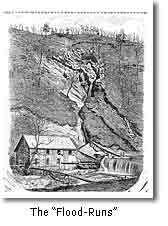 It was during this time that “the Little Findley Mill” was erected on the northwest side of the ridge to mill the ore brought by flume from the large cut on top of the ridge started by W. R. Crisson. This mill was the 10-stamp Hall mill moved from the Lawrence Mine (located on the Mustering Ground near the Dahlonega Public Square) and was run by steam. 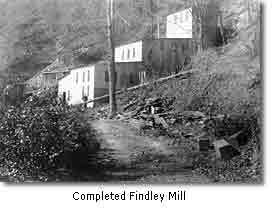 The Findley Gold Mining Company enlarged the “Little Findley Mill” to 20 stamps and increased its steam power. It also replaced the 24-stamp mill beside Yahoola Creek with 40 stamps and installed steam pumps to raise water from the Findley Ditch 175 feet to the top of the ridge for use in working the upper cut. That process was colorfully described by a writer sent to Dahlonega in 1879 by Harper’s New Monthly Magazine to research and write an article on “Gold Mining in Georgia.” The article which appeared in the September 1879 issue provides wonderful eyewitness descriptions of scenes long vanished in time, such as “the ruins of the old United States Mint, looking very romantic in the sunset glow.” Many of them are illustrated with fine pen-and-ink drawings, including a dramatic scene showing great torrents of water sweeping ore down the hillside to be processed in the mill below. Despite the glowing description of the Findley property and its potential described in its prospectus, the Findley Gold Mining Company apparently did not prosper. According to Yeates, this company made the error of sending a young relative of a stockholder, fresh out of mining school, to be superintendent of the mine. He was unwilling to take suggestions from experienced local miners and was unable to find the famed chute, which had been lost. After some work in the open cuts, the operation came to a halt after a couple of years. In 1880, R. B. King leased the property. He located the Findley Chute almost immediately and mined it with great success. Just before his year’s lease expired, he “lost” the Chute intentionally! He reportedly made enough from the vein in twelve months to start a bank in Denver, Colorado. The Findley Gold Mining Company continued to own but not work the Findley property until it was sold at sheriff’s sale in 1885. In 1890, it was purchased by the Trefoil Gold Mining Company of St. Louis, Missouri. This company repaired the mill and put in a set of concentrators, which proved a fruitless expense. The mill was driven by water contained behind a 17-foot-high dam across Yahoola Creek. A 32-inch Leffel turbine wheel furnished 60 H. P. The large pump in the pump house had been installed in 1895 by the current owner of the property, C. Wahl, and was used to pump water to the reservoir on top of the ridge. The water was taken from the Findley ditch, which ran about halfway up the ridge. 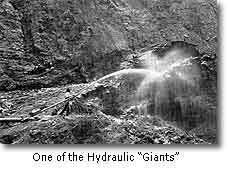 Note: This was one of numerous adueducts which conveyed water from higher elevations with enough pressure to operate hydraulic cannons. What was a slow and laborious process for a man with a pick and shovel was accomplished in a mere fraction of the time by a great jet of water tearing away the earth with as much pressure as 135 lbs. per square inch. It was common to estimate the work of a water cannon as equal to the labor of ten men. Campbell got discouraged and quit, and Witt was almost at the point of giving it up as a fruitless search when he instructed his workmen to put in “one more shot.” If that didn’t break into the gold, they were to “pull out their tools and give it up as a bad job.” The hole was drilled, the dynamite put in, the fuse ignited, and the men hurried out of the hole. After the explosion when the smoke had cleared, the miners went back inside “with bated breath to discover the result.” There, to their astonishment, they saw “exposed to the naked eye an almost solid mass of gold nuggets sticking out like warts on the face of the quartz.” They had struck the famed Findley Chute! According to McNelley, the discovery had taken place “about two weeks ago.” “Captain” Witt had kept his men constantly working to extract the ore and had already mined 326 pounds of the rich ore. He was obviously eager to get as much gold as possible before his lease expired on June 1, at which time the property would be taken over by the Consolidated Company. 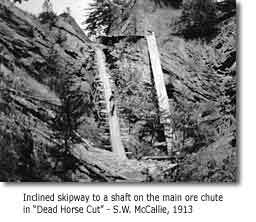 According to McNelly, the Chute was excavated to “about 350 feet” at the time. He noted that Consolidated Company planned to “drive a tunnel in at the base of the hill and intersect the chute some hundred feet below” in order to work the entire vein. The Consolidated Company also proposed to increase the number of stamps on the Findley property from 40 to 100 to give it a 200-ton capacity. At an estimated average value of $3 per ton of ore, the expanded Findley was expected to earn $600 per day. However, the company’s grandiose dreams never came to fruition, and it was bankrupt by 1906. Some mining probably took place on the property in subsequent years but on a minor scale. 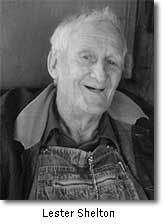 Major Graham Dugas is usually associated with the Calhoun Mine, where he made a big strike in the 1940s and made national news. 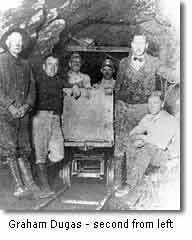 However, two old photographs show him with miners at the Findley Mine in the late 1920s. The extent of his involvement there is not known. A decade later, Cornelius O’Kane erected a new mill on the Findley property beside Yahoola Creek. Lester Shelton worked for O’Kane at the time and helped clear out the area around the old mine so the new stamp mill could be built. He hauled sand from a sandbar on the other side of Yahoola Creek to put in the cement of the foundation. “There wasn’t much of a road to the Findley at that time, so I helped work on it with a drag-pan and mule,” he related to this author in a 1993 interview. “It was real narrow because there wasn’t much room between Yahoola Creek and the bluffs of Crown Mountain. When the owners bought a diesel engine to run the mill, nobody thought they could get it in on that road except for Tal Odum, who said he would do it. Paul Early helped move the 10-stamp “Little Findley” mill from up on Findley Ridge down to the new mill. Other heavy equipment was moved to the Findley from the Mary Henry gold mine. According to Early, a tunnel was dug into the base of Findley Ridge with the intention of striking the historic Findley Chute, but the ore dug out of the tunnel proved to be of a disappointingly low grade. Ross Adams also worked at the Lockhart and Findley Mines when they were owned by “Ol’ Man O’Kane.” “My job was usually shoveling ore with a square-bottomed shovel to feed the stamps that pounded it into fine dust, but the Findley was a self-feeder with a hopper that fed ore directly to the stamp mill,” he related in a 1993 interview with this author. “The crushed ore went into a sluice box to be washed. The gold was heavier and fell to the bottom, where it was caught on copper plates coated with quicksilver. “Every week or so we would have what was called a ‘cleanup’ to get the gold. First, the mercury plates were scraped with a piece of hard rubber. Then the mass of gold and quicksilver was put into a round iron container and heated in the blacksmith’s forge. The heat made the quicksilver boil out and caused the gold to melt and run together so that it came out looking like a half a pound of yellow butter. Sometimes it would weigh six or seven pounds, and I remember throwing a good-sized ball of gold back and forth with another fellow like we were pitching a baseball. O’Kane’s new Findley Mill began operations in the summer of 1940 but only operated a couple of years before World War II put a halt to mining. Men were drafted, and dynamite was unavailable. A college student named Hinton Amerson exploring the mill in 1953 found a newspaper dated 1942, suggesting that the mine was still operating at that time. No history of the Findley Mine would be complete without some information about the man whose name has come down in history because of its association with the mining property and the knob of Crown Mountain still known today as “Findley Ridge.” Since Findley didn’t purchase the property until 1858, the ridge may not have had a name when Dr. Matthew F. Stephenson made his famous speech from the porch of the Lumpkin County Courthouse attempting to dissuade local miners from leaving to join the 1849 California Gold Rush. “Why go to California?” he asked them, pointing dramatically toward the small mountain about a half-mile south of the Dahlonega Public Square. “In that ridge lies more gold than man ever dreamt of. There’s millions in it!” The miners who disregarded his words and headed West nevertheless quoted the expression until "There's millions in it" became a popular idiom. Mark Twain further immortalized the phrase by using it in his book, "The Gilded Age." James Jefferson Findley was born in 1829 and reportedly came to Dahlonega at a young age. A lawyer by profession, he was elected sheriff of Lumpkin County and later represented the county in the Georgia Legislature. During the Civil War, Findley was a Major in Company D, 52nd Georgia Regiment, C.S.A. (“Boyd Guards”) and afterwards a Colonel who commanded the Lumpkin County Home Guards. 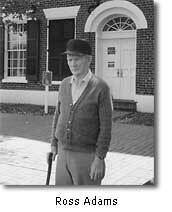 He had his headquarters in the 1836 courthouse, which also served as a jail for deserters, bushwhackers, and other military prisoners. In October of 1864, he was the officer in charge who ordered the execution of three Union soldiers, whom he believed to be bushwhackers who had been burning and looting in the area. A month later, Col. Findley and his 1st Georgia State Cavalry Home Guards followed raiding Union troops over the top of Amicalola Mountain and captured them after a skirmish that took place in Bucktown in Gilmer County. For some years visitors stopped at the roadside park to read the Findley Ridge Historical Marker and enjoy the scenic view of the town below with its backdrop of blue-green mountains. Local residents sometimes took picnic lunches to eat on the concrete tables or had cookouts on the outdoor grills. While Highway 60 was widened, however, the small roadside park was destroyed. 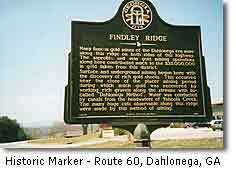 The Findley Ridge Historical Marker put up by the Department of Natural Resources was missing for a number of years but has now been replaced and may be seen on the right side of the road as motorists reach the summit of Findley Ridge headed into Dahlonega. Attempts have been made in recent years to open the historic site to those interested in viewing the remaining artifacts, but the costs of making the area safe and accessible were prohibitive. At this time the Findley property is privately owned and is not open to the public.